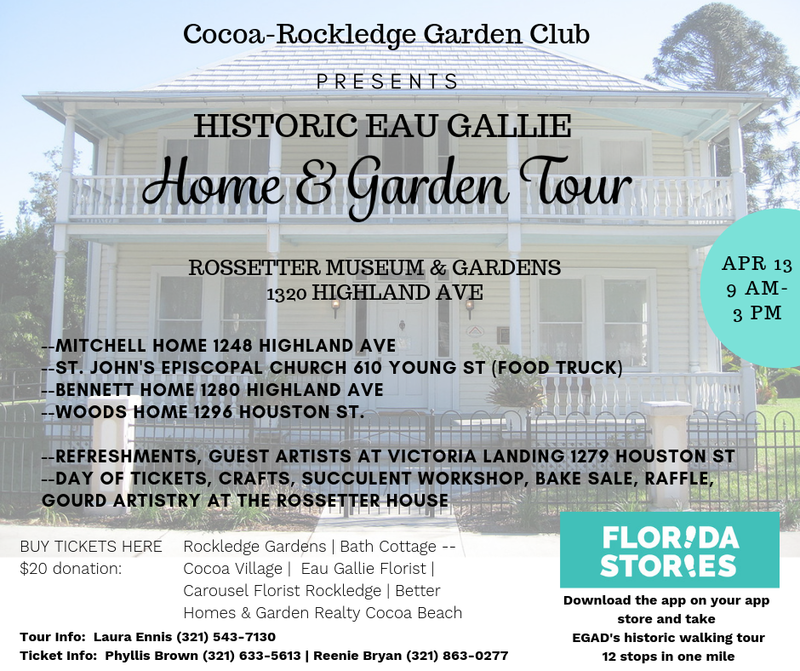 APRIL 13 -- come take the home tour hosted by Cocoa-Rockledge Garden Club. Buy tickets on the day of or at satellite locations ($20 donation). Most details below. If you don’t get tickets ahead of time online or at a site location listed below, start with the Rossetter House, 1320 Highland Ave, to get your day of tickets. ON THE SAME DAY, from 9-11 am, join a two hour tour of Eau Gallie’s murals guided by Nancy Dillen. Start at the Eau Gallie Public Library. This is FREE, but register please. WHILE YOU’RE HERE, take the audio history walk featured on the Florida Humanities Council app called FLORIDA STORIES. Download it from your app store before you leave home and bring a headset so you can hear it. It’s a one mile walk showcasing 12 historic properties. You don’t have to walk it; you can drive your car if you wish.